Despite all of the recent talk of the "new" navy, there is no greater symbol of U.S. Sea Superiority than the nuclear Aircraft Carrier. And. there is arguably no better namesake for the soon-to-be commissioned CVN- 76 than President Ronald Reagan, whose mission of a 600-ship Navy helped to define a generation. At first glance, from outside appearances, CVN-76 may appear to be a standard nuclear Aircraft Carrier, though "standard" is a gross understatement in this instance. But housed in the hulking grey hull - a hull that measures more than 1,092 ft. (332.8 m) long, towers 20 stories above the waterline and sports a 4.5- acre flight deck - is a wealth of new technology and engineering advancements. These changes service to differentiate the Ronald Reagan from its predecessors and establish it as a platform for future carrier and fleet technology. The Plug-and-Play City A nuclear aircraft carrier is often likened to a standalone city, home to 6.000 personnel and self-sustaining for up to 90 days at a time, with everything from the most state-of-the-art land-based machine shop to a full dental and surgical unit. Yet these modern manufacturing marvels are the biggest piece in an elaborate web of military might, designed not simply as the platform to launch and recover aircraft, but to serve as the nerve center and processing point for increasing amounts of information. "Network Centric" is the buzzword of tomorrow's Navy, and the nuclear Aircraft Carrier - particularly the Ronald Reagan - is designed to increasingly fulfill the role of coordinator. To accommodate today's and future needs to efficiently gather, analyze and disseminate information, one of the major technological advance on the ship is the enhanced Integrated Communications and Network (ICAN) system, featuring an advanced fiber optic network. CVN-76 is literally bursting with new technology inside, with the integration of touch screen monitor controls around the ship to commandeer everything from compartmental ventilation to firefighting capabilities. Ronald Reagan, the ninth Nimitz-class nuclear aircraft carrier, also features many additional design features, including: • Island House: The first major design change in the Island House since the original design in 1960, it is the same height but has one less level, giving an additional 9 in. of overhead space per level to accommodate larger amounts of wiring for systems. This was the first time an island was designed using 3-D product modeling (Catia). In addition, the weapons elevator is now housed in the island, and important design modifi- modification, which allows weapons handling on deck during flight operations. • Deck: The deck angle on CVN-76 was changed slightly, a move that allows the carrier to launch aircraft off both catapults while simultaneously retrieving aircraft. Combined with the integration of the weapons elevator into the Island, this greatly enhances the efficiency of flight operations. • Mainmast: A new mainmast has been designed which increased the 57-in. diameter mast polte to an eight-ft.
square mast. The new design keeps electrical and piping systems in a ballis- tic enclosure for survivability purposes. The AFT mast was relocated from the island house to put it in closer proximity to other radar systems. • Bulbous Bow: Reagan is the first to have a bulbous bow. designed to improve flight operations. In addition, larger arresting gear is installed, allowing the ship to recover heavier aircraft. The Ultimate Jigsaw Puzzle Taken as a whole, the modern Aircraft Carrier is mind numbing in magnitude; taken in pieces, it is mind blowing. From keel to delivery Reagan took five years to build, and incorporated more than 47.000 tons of structural steel and about a million pounds of aluminum. It features four bronze propellers, each 21- ft. in diameter and each weighing 66.220 lbs. Steering is accomplished by a pair of rudders, each measuring 29 x 22 ft. and weighing 50 tons. It has a distillation plant that provides 400.000 gallons of fresh water from sea water daily, nearly 30.000 light fixtures, 1,325 miles of cable and wiring, 1.400 telephones, 14.000 pillowcases and 28,000 sheets. The question then becomes: How does it all come together? Enter Bob Gunter, Jr.. Northrop Grumman Newport News' senior V.P. Aircraft Carrier Program and his cohorts: Nearly 18,000 NNS employees, the U.S. Navy, and veritable boat load of outside products and systems suppliers. Gunter explains that several developments with Reagan paid off tremendously in terms of efficiency in the construction of Reagan, development, which will greatly enhance the construction of CVN-77, the George H.W. Bush, as well as the next generation of Aircraft Carrier currently under design. 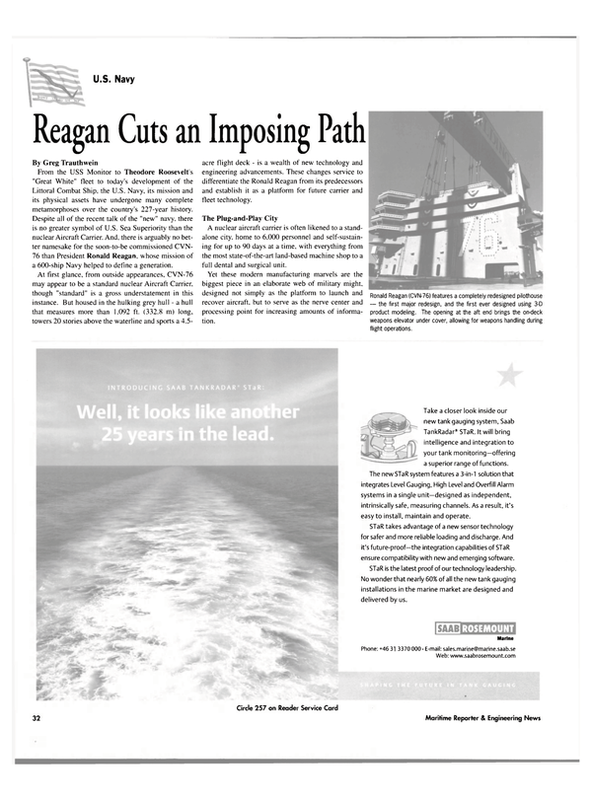 In short, modular construction techniques and software integration — long bastions of the commercial marine market — were used in earnest on Reagan to great result. Gunter explained that for production NNS ascribes to the "1-3-8 Rule": What takes one hour in the shop takes three hours outside, and eight hours on the ship. "Our goal is to drive more pre-outfitting into the shop." he said. The capability to accomplish this lies in NNS's selection of IBM/Dassault System's Catia CADCAM program, as well as its recent, company-wide SAP System installation, which effectively combines all databases into a seamless unit. IBM served as integrator for both Dassault and SAP, helping to make the decision. NNS's manufacturing area is a complex of specialized fabrication shops, where the pieces of the puzzle start to take shape. Using information generated by CADCAM in the engineering area, employees work with NC machines to produce parts that meet precise specifications. Parts then are moved for insertion into one of the ship modules, with a module the culmination of several "Base A" units formed in the 11-acre Automated Steel Factory. The units are then welded to other units to form a module or superlift weighing up to 900 tons. On the construction of Bush, the shipyard will produce even bigger pipe bank assemblies to push efficiency, with enormous carryover benefit for the design and development of the new class of Aircraft Carrier, CVNX. While plans are still under consideration for the next-generation, a streamlined propulsion plant has already been designed, and work is underway on the rest of the ship.